Osaka Prints - Produced in the Kansai region, including Osaka and Kyoto, Osaka prints or kamigata-e are instantly distinguishable from typical Edo ukiyo-e. A major difference is the choice of subject matter. 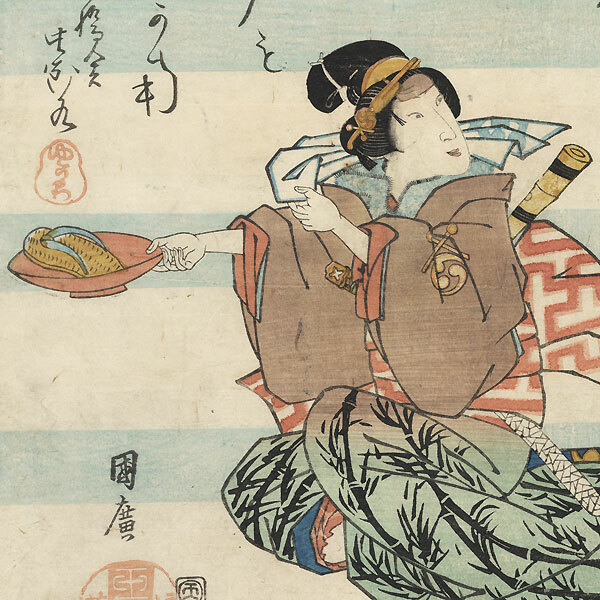 Osaka prints were nearly always portraits of actors or kabuki scenes. In contrast, Edo print subjects included beauties, landscapes, nature scenes, warriors, and historic events, in addition to kabuki. Distinctly different artistic styles also emerged in Edo and Osaka in the 18th and 19th century, resulting in certain recognizable characteristics for each area. 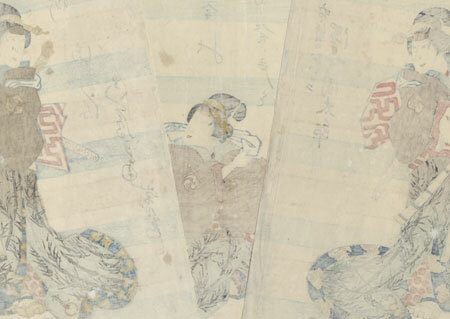 Osaka prints feature more subtle, serious figures, reflecting the wagoto or soft style of acting prevalent in the area, along with distinctive facial expressions. The aragato or brash manner of acting popular in Edo influenced print designs towards bolder images of heroism and military prowess. Much like the style of the prints, the demand for ukiyo-e in the cities of Osaka and Edo also varied. Osaka produced far fewer ukiyo-e designs than Edo did. As a consequence, Osaka prints are rarer and also some of the highest quality prints made in the 19th century, with many featuring deluxe techniques such as burnishing or embossing. Osaka prints are a rare and wonderful collecting area of Japanese woodblocks. Comments - Great Osaka triptych depicting three beauties as otokodate or street knights in a parody of a famous play with men in the main roles as a gang of thieves. Each woman is armed with a single sword and a shakuhachi flute, and they exchange strange glances. The beauty in the center holds out a shallow red lacquer sake cup with a sandal in it, a grave insult since sandals are dirty. From left, the actors are Sawamura Kunitaro as Hotei no Oichi, Iwai Shijaku as Kaminari no Oshiyo, and Nakamura Matsue as Karigane Obun. Blue bands across the background add graphic appeal. A rare full oban format Osaka triptych. Condition - This print with excellent detail as shown. Three separate panels. Small losses at edges and wormholes, repaired. Slight toning and soiling, a few creases and stains, slight rubbing at edges. Please see photos for details.